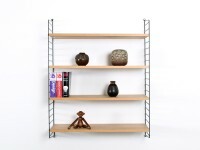 Nisse Strinning was best known for the String bookshelf system that he and his wife, the designer Kajsa Strinning, designed in 1949 for a contest initiated by Bonnier public library. In the 1940s, he studied architecture at the Royal Institute of Technology in Stockholm . Already as a student, he designed a dish rack which consisted of plastic coated metal wires. Dish rack, which was named elfa (not to be confused with electronics company ELFA), became very popular and was then starting when he and his wife created the famous String shelf. 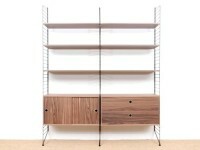 In 1952 he founded the two companies String Design AB and Swedish Design AB. Together with his wife, he designed many plastic items in 1960—and 1970s. 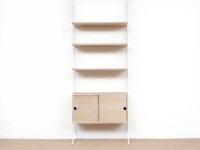 Nisse Strinning is rightly seen as a contemporary design classic (see other article). 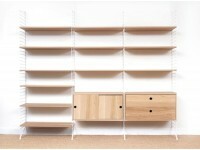 Diversity of executions of the bookshelf may be seen in the catalogues. 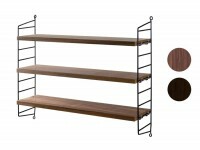 Mid-Century modern scandinavian shelves String System in walnut. New édition. 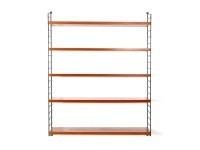 Mid-Century modern scandinavian shelves String System in oak. New édition. 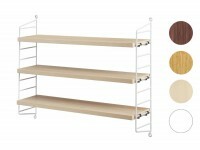 Mid-Century modern scandinavian shelves String System in oak, ash or black stained. New édition.